White Folks explores the experiences and stories of eight white people from a small farming community in northern Wisconsin. It examines how white people learn to be ‘white’ and reveals how white racial identity is dependent on people of color—even in situations where white people have little or no contact with racial others. Drawing on in-depth interviews with Delores, Frank, William, Erin, Robert, Libby, and Stan, as well as on his own experiences growing up in this same rural community, Lensmire creates a portrait of white people that highlights how their relations to people of color and their cultures are seldom simple and are characterized not just by fear and rejection, but also by attraction, envy, and desire. White Folks helps readers recognize the profound ambivalence that has characterized white thinking and feeling in relation to people of color for at least the last two hundred years. There is nothing smooth about the souls of white folks. Current antiracist work is often grounded in a white privilege framework that has proven ineffective — in part because it reduces white people to little more than the embodiment of privilege. Lensmire provides an alternative that confronts the violence at the core of white racial selves that has become increasingly visible in American society and politics, but that also illuminates conflicts and complexities there. This provocative book demands that we take the whiteness of struggling rural white communities seriously. It does so not by asking "What’s the matter?" with those who live in the Wisconsin countryside but by listening to residents describe the complex processes through which segregated lives produce imaginations of race that are at once counterproductive, tragic, and very much unstable. Intelligent, ambivalent, and penetrating, Lensmire is sincerely vulnerable as he struggles to make sense of the complex ways his hometown peers and he used people of color to define themselves, why the rest of white America has for generations, and why they may for generations to come. Lensmire has the wisdom to put many things in their right place critically and creatively while astutely realizing many mysteries remain. White Folks is theoretically robust and empirically grounded. This grand piece of scholarship is an act of love; its beautiful rendering is a work of art. 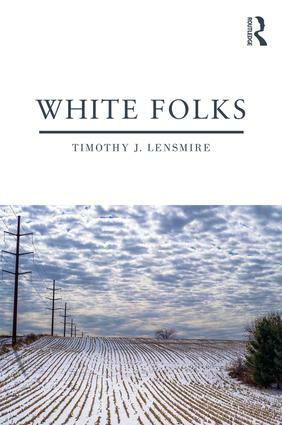 In these tense moments of resurgence of white identity politics, Tim Lensmire’s intrepid yet compassionate ethnographic exploration lifts the veil on White Folks to reveal complexities, conflicts, and contradictions at the core of white racialized selves, evidenced by grounded insights from their own experiences. This cogently written book uniquely captures how whiteness and blackness have always been intricately linked in spite of and because of the violent history and hierarchy of race as it is socially constructed in the United States. Lensmire’s stories of his own and white community members’ memories of racism, told in conversation with essays by Ellison, Baldwin, Thandeka, and Hall, offer essential insights into the contradictory and continuing formation of white racial identities. Educators, committed to dismantling racial inequality, will find these stories and related analyses to be compelling openings to dialogue and reflection -- about the ways racism, whether openly expressed or swiftly silenced, shapes the talk, emotions, interactions, expectations, daily human dramas, and imagined futures of white folks in rural America. Lensmire’s clear-sighted storytelling calls us to see the distorted relationships we have made with/in ourselves, to name the unending costs of racism and to change the ways we read, write, and talk about whiteness and racial inequality in school and society. Lensmire’s prose is strong and empathic, telling stories that are both simple and incredibly complex. His methods are (auto)ethnographic, and his subject is public pedagogy—the ways public space, popular culture, and everyday practices teach us what we should know, who we should be, and what we should value. . . . At this moment, I can think of no more important text for teachers and teachers-to-be to read and discuss than Lensmire’s short, carefully theorized book. White Folks may be viewed as an attempt to respond to this call [for more complex treatments of how to work with white people on questions of race and white supremacy], weaving together two strategies. The first is theoretical. From the broad body of academic and belletristic work on whiteness, Lensmire pulls out and wrestles with those insights he believes to be most useful for moving forward. . . . The second—and more distinctive—strategy is personal: Lensmire decides to go home. One of the most important contributions that Lensmire makes to the field of race and ethnicity is unmasking the interiority of whiteness – as a physical place and a psychic location. From the first chapter, Lensmire challenges the myth-making of the affectionate Heartland by recalling how the region is born from indigenous genocide. Disneyfied stories of rural America cannot white out the dark history that continues to haunt the soul of a nation. The un/masking that Lensmire performs throughout the book to explore the interiority of whiteness is incredibly affective. The racial epiphanies recall guilt, shame, anxiety, desire and fear, and those feelings inform an ontological whiteness that Lensmire suggests emerges from profound racial ambivalence – an ambivalence that readers recognize from the spectacular minstrel performances to the everyday enactment of white identity. Timothy J. Lensmire is Professor in the Department of Curriculum and Instruction at the University of Minnesota, where he teaches courses in literacy, critical pedagogy, and race. His early work focused on how the teaching of writing might contribute to education for radical democracy. His current research seeks to build descriptions of, and theoretical insights about, how white people learn to be white in a white supremacist society. Writing Lives: Ethnographic and Autoethnographic Narratives publishes autoethnographic and narrative research　projects across the disciplines of the human sciences—anthropology, communication, education, psychology, sociology,　etc. The series editors seek manuscripts that blur the boundaries between humanities and social sciences. We　encourage novel and evocative forms of expressing concrete lived experience, including literary, poetic, artistic, critical,　visual, performative, multi-voiced, and co-constructed representations. We are interested in ethnographic and　autoethnographic narratives that depict local stories; employ literary modes of scene setting, dialogue, character　development, and unfolding action; and include the author's critical reflections on the research and writing process,　such as research ethics, alternative modes of inquiry and representation, reflexivity, and evocative storytelling. Prospective authors should submit a Routledge Book Proposal form, current CV, and a completed or nearly-completed manuscript to abochner@usf.edu, cellis@usf.edu, and tadams@bradley.edu.